Homo erectus was the earliest hominin to disperse outside of Africa. Until then all hominin fossils from about 6 Mya to 2 Mya are restricted to Africa. Almost as soon as H. erectus appeared on the savannahs of East Africa around 1.8 Mya it spread as far north as Dmanisi, Georgia, and as far east as Java, Indonesia. 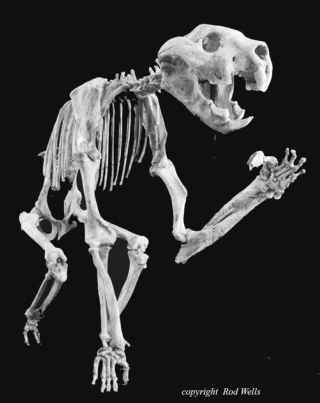 H. erectus endured in parts of Indonesia until as late as 30 Kya. This massive geographic and temporal range of H. erectus is the inspiration for the two major rival theories of modern human geographic origins and dispersal. Although many paleoanthropologists' hypotheses fall somewhere in between, the two models for modern human origins are known as the Out of Africa (OA) or "Replacement" or the "Garden of Eden" model and the Multiregional (MR) or "Regional Continuity" or "Trellis" model (Figure 6.1). Despite the names of the models, both agree that the roots of human evolution lie in Africa. They just disagree on the timing and the amount of evolutionary participation from H. erectus and Archaic populations around the world. Currently more scientists favor OA because of the convincing genetic evidence, but neither model has been conclusively supported to the exclusion of its rival, nor has either been conclusively refuted. Figure 6.1 The two extreme, rivaling models for the origin of modern humans both agree that a H. erectus or Archaic ancestor evolved in Africa and then dispersed around the Old World. But, the Multiregional (MR) model holds that the ancestor evolved into modern humans, while the Out of Africa (OA) model posits that those early populations faded away and were replaced by a second, modern human wave from Africa after 200 Kya. Illustration by Jeff Dixon. different geographic regions were linked with gene flow like they are today, but that gene flow began 1.8 Mya. Evidence supporting this hypothesis is mostly morphological. MR points out that like modern humans, extinct hominins show geographic variation and adaptations and supporters link that regional anatomy of hominins to modern humans living in those regions today. Modern Chinese populations retain features similar to fossil H. erectus and Archaic humans from the region like shovel-shaped incisors and certain features of face and skull shape. Comparisons are also made between H. erectus and indigenous Australians. Also, modern Europeans are argued to retain similarities with Neanderthals like nose size, body size, stature, and robusticity. Tantalizing evidence for interbreeding between Neanderthals and modern humans also supports MR. The discoverers of a child's skeleton in Lagar Velho, Portugal, suggest it is a "love child" because ofits mixture of Neanderthal and modern human features. The skeleton, buried with pierced shells and red ochre from Lagar Velho, Portugal dates to about 25 Kya and has Neanderthal-like limb proportions with a human's chin. Critics are not convinced ofthe hybrid claim, however, and argue that the proportions lie within the human range, albeit on the cold-adapted end of the spectrum. Erik Trinkaus sees mosaic features in other European fossils as well, like from Romania around 40 Kya. Unfortunately, there is hardly a way to prove that Neanderthals and modern humans did not interbreed without finding, for example, a Neanderthal skeleton buried in the same grave as a modern human. Perhaps as the map of the Neanderthal genome grows and as understanding of gene functions increase, geneticists will be able to determine whether or not there would have been molecular barriers to their interbreeding with humans. The strict OA model holds that after hominins dispersed from Africa first as H. erectus and Archaics, a second major dispersal of modern humans replaced those existing populations around the world with no genetic mixing. (Although looser interpretations of OA allow a small amount of gene flow.) Replacement could have been the result of indirect competition, like simply out-surviving the more primitive groups, or direct competition like warfare and genocide. Strict OA includes no interbreeding between modern humans and Archaics and argues that modern human geographic diversity occurred recently after 200 Kya. Fossil and archaeological evidence support OA since the oldest modern humans are found in Africa (Omo I and II). The anatomical similarities across modern human populations are exceedingly closer than the similarities between premodern and modern humans within a particular geographic region. Furthermore, ifArchaics were evolving into modern humans, there should be no overlap in their existence, yet at the Israeli sites of Skhul and Qafzeh from 110 to 90 Kya, modern humans were living very close to Neanderthals at the nearby site of Tabun around 110 Kya. The first modern humans arrived in Europe by 40 Kya and had tropical adaptations in their body proportions, but Neanderthals were still evolving there until 28 Kya with their adaptations to the cold. After 40 Kya there are many modern human occupational sites across Western Europe. The oldest evidence comes from sites like Bacho Kiro and Temnata, Bulgaria, (43-40 Kya), Pe§tera cu Oase, Romania, or "cave with bones"(40-35 Kya), then Kent's Cavern in England (30 Kya). The overlap between modern humans and Neanderthals in Europe lasted about 10,000 years before Neanderthals disappeared. Some proponents of OA have blamed humans for causing the Neanderthals' demise. As discoveries accumulated in the Middle East and Europe a clear pattern emerged: modern human and Neanderthal sites remained distinct, but Neanderthal sites became fewer and farther apart through time.